Brighton served up a clinical display to dispatch Jose Mourinho's Manchester United and pick up a first Premier League win of the new campaign at the Amex this afternoon. First half goals from Glenn Murray - his first of the season - centre-half Shane Duffy and German Pascal Gross fired Albion to an impressive 3-2 triumph, leaving lacklustre United stunned. Murray, superbly flicking home a Solly March cross, and Duffy struck in two first half minutes to leave United reeling. Belgian forward Romelu Lukaku marked his first appearance since the World Cup with a goal to get the visitors back in it ten minutes before the break but Pascal Gross' spot-kick after 43 minutes restored Albion's two-goal cushion - rounding off an emphatic first half performance. Paul Pogba's penalty in second half stoppage-time gave United a glimmer but Brighton held out - ensuring they made it successive home wins over Mourinho's men at the Amex after the 1-0 triumph over them, which sealed their Premier League status, back in May. Albion made two changes from the side that were beaten at Watford on the opening day with former Barcelona and Valencia full-back Martin Montoya - handed his Seagulls debut - and Gaetan Bong coming in for the injured Bruno and Bernardo. United boss Jose Mourinho brought Romelu Lukaku, Anthony Martial and Ashley Young in to the side from the team that beat Leicester last time out with Marcus Rashford, Matteo Darmian and Alexis Sanchez - not in the matchday squad - making way. Brighton started brightly but were fortunate not to go behind after ten minutes. Centre-back Lewis Dunk was caught in possession by Lukaku with the ball falling to French World Cup winner Paul Pogba who slid Lukaku clear but he skewed a left-foot strike just wide of the post from just inside the area. Seagulls skipper Dunk was hurt after being dispossessed by Lukaku and forced off ten minutes later as Leon Balogun was introduced for his first Albion appearance. Winger Anthony Knockaert fired United a warning, getting in behind and latching on to a superb Dale Stephens pass before sending a shot wide of David De Gea's goal on 23 minutes. Mourinho's men were then shaken following a crazy two-minute spell. Albion took the lead after 25 minutes as Glenn Murray superbly flicked Solly March's cross past De Gea from close range for his first goal of the season. The crowd had barely finished celebrating the opener when Brighton bagged another less than two minutes later. United fail to clear a corner and centre-half Duffy kept his composure before rifling a left-foot drive beyond De Gea from all of ten yards. The visitors, left reeling after two Brighton goals in as many minutes, were back in it ten minutes before the break. Albion this time were unable to fully clear from a corner, full-back Luke Shaw's scuffed cross bounced in to the ground but found Lukaku who glanced a header home to get United right back in it. Brighton would have been fearing a United onslaught prior to the interval but, remarkably, it was the home side who restored their two-goal advantage on 42 minutes. German midfielder Pascal Gross took a poor touch after receiving a pass, only for Eric Bailly to bring him down in the area as referee Kevin Friend pointed to the spot. Gross dusted himself down, stepping up and seeing his penalty go in despite hitting De Gea's left foot. Mourinho would have been far from impressed by his side's first half display, reacting at the break by introducing England internationals Jesse Lingard and Rashford - for Martial and Andreas Pereira respectively - immediately after the interval. United fired a couple of warning shots early in the second half but Brighton were not facing a barrage of pressure from the visitors as they look to claw themselves back in to it. Albion's Australian goalkeeper Mat Ryan pulled off a fine stop to deny Pogba 15 minutes from time with United looking for a lift. Frenchman Pogba was allowed time to take a touch and fired a 20-yard thunderbolt goalwards but Ryan superbly tipped wide. Duffy clumsily brought down substitute Marouane Fellaini in the area in second half stoppage-time as Pogba effortlessly fired home the penalty but there was no time left as Albion were worthy 3-2 winners. 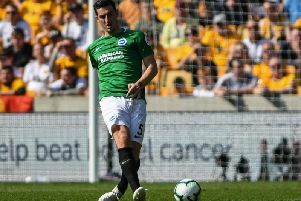 Brighton: Ryan; Montoya, Duffy, Dunk, Bong; Knockaert, Propper, Stephens, March; Gross; Murray. Subs: Button, Kayal (Gross, 89), Bissouma, Locadia (Murray, 92), Balogun (Dunk, 20), Jahanbakhsh, Bernardo. Manchester United: De Gea; Young, Lindelof, Bailly, Shaw; Pogba, Pereira, Fred; Mata, Lukaku, Martial. Subs: Grant, Rashford (Mata, 45), Smalling, Lingard (Pereira, 45), Herrera, Fellaini (Martial, 60), McTominay.